Looking for an roofing invoice template that will work for your business? Whether you work in residential or commercial business, we've got you covered. Plus, it's free! Do I need more than just a roofing invoice template? 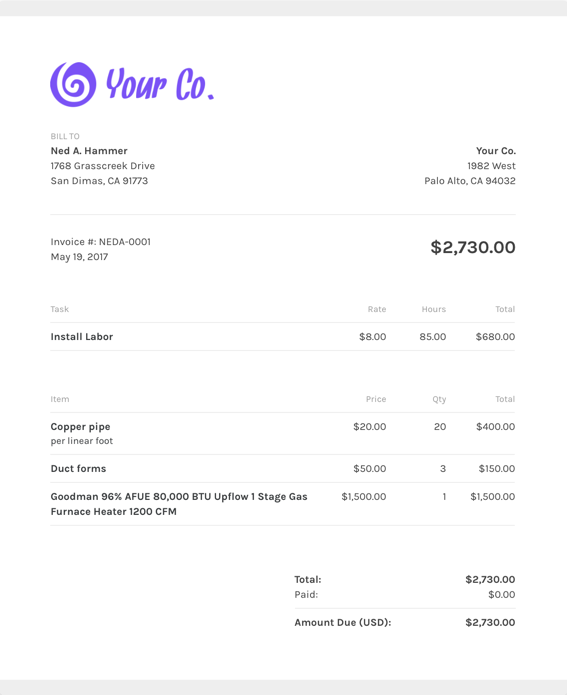 Looking for a roofing invoice template? We've got you more than covered. We're here to help you focus on patching up roofs instead of patching up your finances. ZipBooks invoice templates allow you to set up late payment reminders so you can make sure you get paid fast so you can move on to the next project. The reminders have variables that are customizable so you only have to make one and it will automatically fill in the basic information you need. What should I include on my roofing invoice template? Using ZipBooks for your roofing invoice means never sending off an invoice without your own company’s information on it (oops!). We’ve collected data from tens of thousands of invoices and use it to score your invoice based on what information you include so you’ll get you paid faster. Why should I use ZipBooks’ roofing invoice template to create and send my roofing invoice?